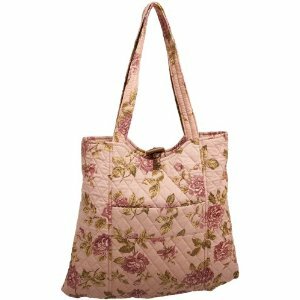 For many people the idea of a quilted floral tote is simply too chintzy and quaint to bear. However, I think totes like this Isla edition by Lily Waters could actually look stunning if worn in the right way. How should you wear this? Well, the floral pattern lends itself nicely to the festival season, and I think it would look perfect teamed up with a long simple maxi dress, or even being clashed with some contrasting patterns. After all, the quilted fabric on the exterior is in a very country-bumpkin style, yet is subtle enough to work in an outfit rather than dominate it. When wearing this retro tote, you do run the risk of looking as if the bag is likely to house your dishcloths and your clothes pegs. As such, make sure to dress it up when you wear it, and that will allow it to look much more glamorous. Of course, at the same time it comes with enough pockets to make it eminently practical, and I love any handbag that has an exterior pocket. If you are still not convinced, then maybe the price will be the final nail in the coffin of your love for this bag. It costs a teeny tiny $21.04, making it a very reasonable investment! The Vera Bradley Tic Tac tote, a great alternative to this floral bag.